I wrote a few words on patriotism via cake for Sunday Life magazine in the lead up to Australia Day. With a recipe for lamingtons, I basically endorsed an explosion of patriotic fervor in the kitchen. Australia Day, with its street parties and pageantry, garden barbecues and First Fleet memorabilia, is a reminder of times of yore. It casts back to when people baked, when we wrapped aprons around our waists, delighted in waratah-printed tea towels and got carried away with celebrating who we are. The day itself, what is represents and what it means to Indigenous Australians and many others, may not be one we should be hailing at all. But if not Queen and country, if not Botany Bay, if not the arrival of the British, then what? Even if the date is incongruous, Australia Day can represent who we are now; multicultural, young and free, intelligent and bold. But that doesn’t mean we have to give up entirely on tradition, and in particular lamingtons. The quintessentially Australian cake was, predictably, invented by a Frenchman. In 1900, the Governor of Queensland and his wife, Lord and Lady Lamington, apparently dealt with a glut of visitors to Government House in Brisbane by serving this dessert, created by in-house chef Armand Galland. Keen to cater to the onslaught of visitors, the chef used day-old sponge cake, a technique that modern day bakers have happily adopted because it prevents too much crumb getting stuck in the chocolate. We might forgive ourselves a bit of joyous Australiana cliché. Baking lamingtons on Australia Day, squirting sauce on to a meat pie and firing up the barbecue, gathering friends and family, are emotional national nods, visceral kicks of nostalgic patriotism. As someone who bristles at the sight of store-bought fare, and who believes cooking is about putting something of yourself into it, I’ll be baking on Australia Day. If we can associate homemade with love and caring, then beating together eggs and sugar, flour and butter, and rolling perfect squares in chocolate and coconut is a way to share a most basic bounty and something of ourselves. I can identify with people who say they don’t have time to bake, but see this instead as a time to bond. It’s really not such a major undertaking, the combination of the three flours means a veritable fail-safe light and airy cake. Do the cake a day ahead if you like, or go ahead and make the lot a day ahead if you fancy. With all the flag waving and zinc-wearing, people will just be glad you got into the spirit of it all. 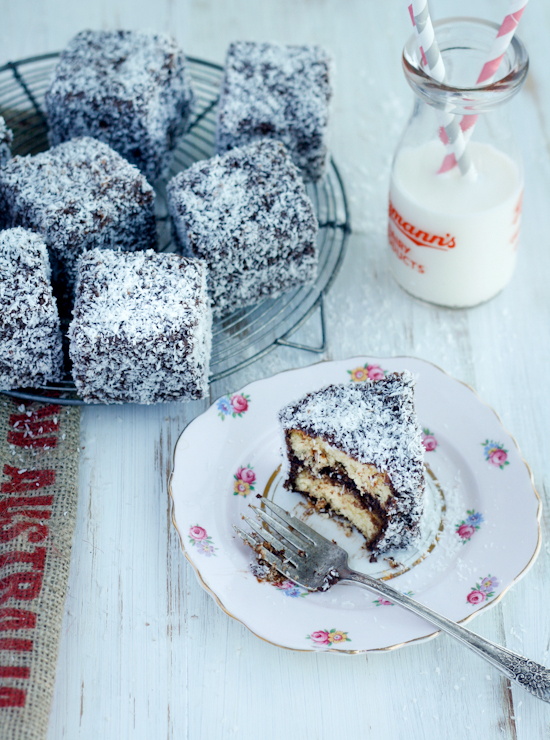 Find the recipe for lamingtons on Daily Life here.